So, you need a business loan, and want to browse which loans might potentially be available to you. Cashio.com is a website which helps you do this easily, without taking any sort of brokerage fee from you or making you enter any personal information. Essentially, in order to get business loans, you enter your state (this service is only available for the US at present), select your type of business, how long you’ve been in business and your annual income, and your personal credit score range. Based on this information, you’ll be able to see what loans you could avail and their details (such as the amount, interest rates, and the like), and select whichever one is most appropriate for your needs. It’s an easy-to-use platform for finding the right business loan, and won’t cause you to spend needlessly on finding it (the fee is collected by Cashio from the lender, not the customer). 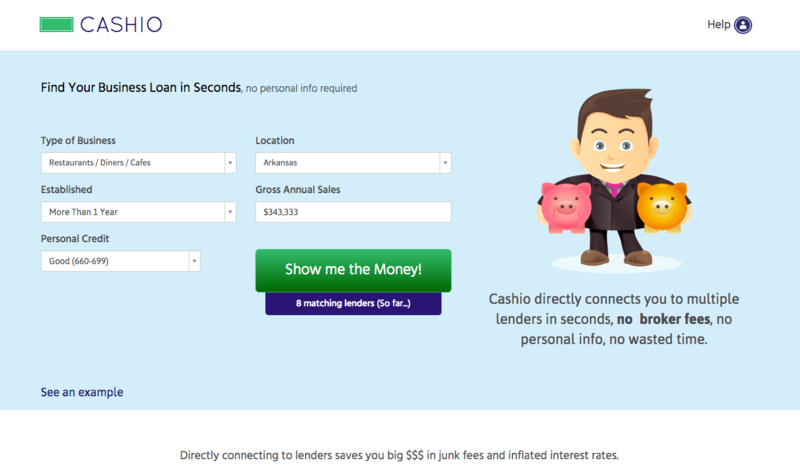 So if you have a good idea, or if you have an income, Cashio makes it easy to find the right loan for your business. And the folks at Cashio will stay in touch with you to ensure that you’re satisfied with your lender’s service, and to ensure that you’ve been assisted to the greatest extent in securing the loan that your business needs. Brokers and lenders both have a habit of bombarding potential customers with an endless supply of marketing material, leading to confusion over what a business’s best option for a loan might be. Brokers are the worst of the lot though, harassing you with phone calls and junk mail, as well as flouting around with your personal information. And they raise closing fees and financing costs, wasting your time and money. Cashio’s site is encrypted, and your information is only submitted to your selected lenders, so there’s no need to worry about any third party viewing your information without your knowledge or consent. Cashio’s lenders are drawn from the top fifty alternative business lenders in the US, meaning that they’re reliable, secure, and quick with their approval process. Since the search results on Cashio are not biased beyond the few details that you provide (none of them so personal) when doing the search, there’s less need to worry about factors such as racial profiling or lenders refusing funds based on the sort of establishment you run.